Ever wonder how to make prosciutto? Or what exactly a rillette is? Wonder no more, because Patina's Cafe Pinot in downtown Los Angeles is holding a monthly charcuterie class with their chef, Joe Vasiloff. Every month's class is different and I attended the one in February where we made duck breast prosciutto and duck rillette. Making charcuterie means curing meat. And curing means you need curing salt. 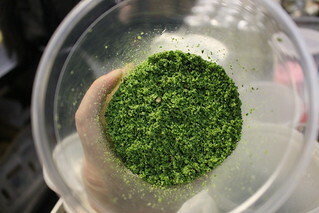 Vasiloff uses this salt recipe full of herbs that he learned from Chef Thomas Keller when he worked at Bouchon in Las Vegas and Beverly Hills. 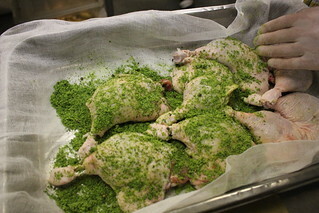 Duck legs are cured in the salt for hours then confit-ed for the duck rillette. This is a hands-on class where you'd have to trim duck fat and learn how to wrap meats for hanging. I LOVE tamales but I have a hard time to find ones that are just right for me. I want them filled with things I like, for example I'm always looking for a blue corn tamale but the ones here are usually only filled with cheese. So, when Ortega 120 offered me to attend one of their tamale making class, I thought it sounded fun. The tamale class is only held in December since tamales are apparently a holiday tradition. The chef said that his family would always say that way you will always have something to unwrap for Christmas! Ortega has their own masa, made with Canola oil so it's healthier but still moist. 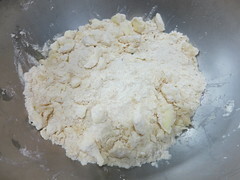 You can buy their masa to go at the restaurant, or you can also buy traditional masa at Mexican bakeries. They had prepared the masa for us and the filling which included chicken and beef tinga, chili and cheese. 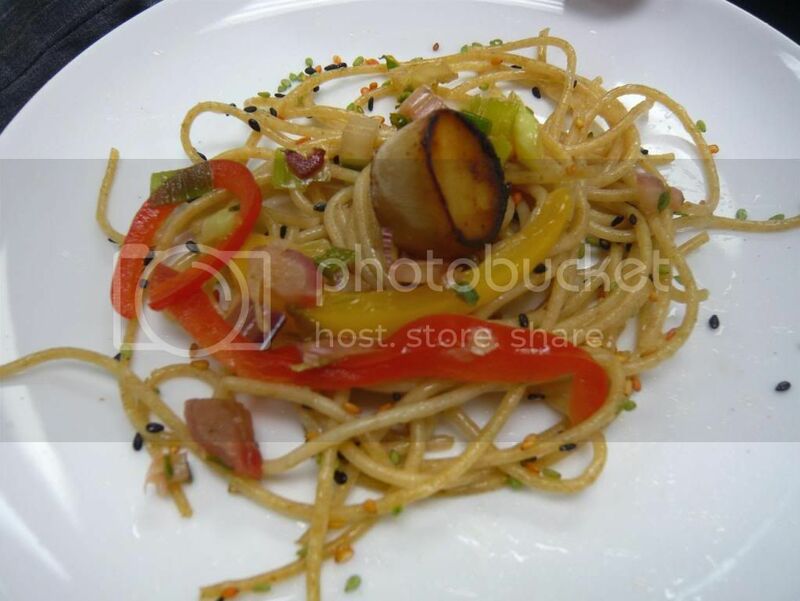 They provided the recipes for these fillings, but during the class all we had to do was assemble them. Spreading the masa on the corn husk was harder than I expected at first, since you don't want it to be too thick, though eventually I got used to it. Culinary College was back for its second run with chef Andrew Kirschner from the Wilshire Restaurant. Hosted by Los Angeles magazine and Snyder Diamond, the event is again hosted in the Snyder Diamond showroom in Santa Monica. I was early, so I sat there sipping a glass of 2008 Viognier from the Santa Ynez Valley, picked by Ian Blackburn from Learn About Wine, waiting for the rest of the girls to show up. I was joined later on by Wandering Chopsticks, Caroline on Crack, Estarla, Shop Eat Sleep, and Faux LA Hipster. We start out with some appetizers prepared by Chef Bridget Bueche from Sub-Zero/Wolf. First up: Wood plank salmon with miso base, mizuna, japanese long onions. 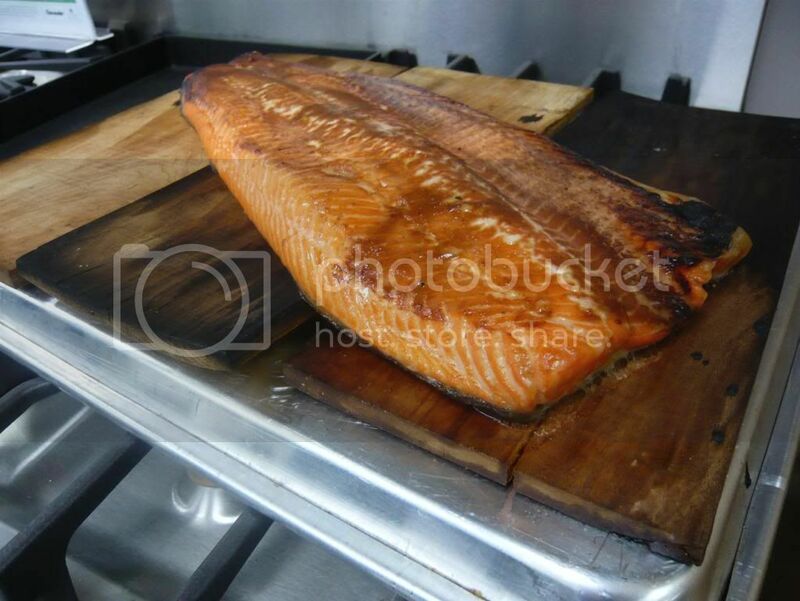 Before the food was served, a large piece of salmon was displayed sitting on the wood plank, teasing us with the glaze and the smell. 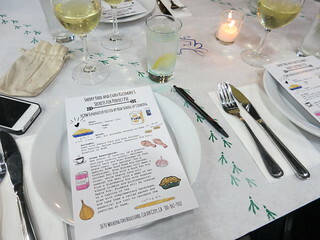 Each dish is paired with a wine, selected by Ian from Learn About Wine. Ian did not only pick wines that will go well with the dishes, he also made sure to choose affordable wines that you or I may actually go out and buy. The salmon was paired with a Pinot Noir from Sweeney Canyon. Sweeney Canyon is a family-owned vineyard in the Santa Rita Hills of Santa Barbara County, near the Santa Ynez River, which gives their grapes a unique complex flavor. While eating and sipping, we watched chef Bueche whip up our next dish using a Japanese claypot. 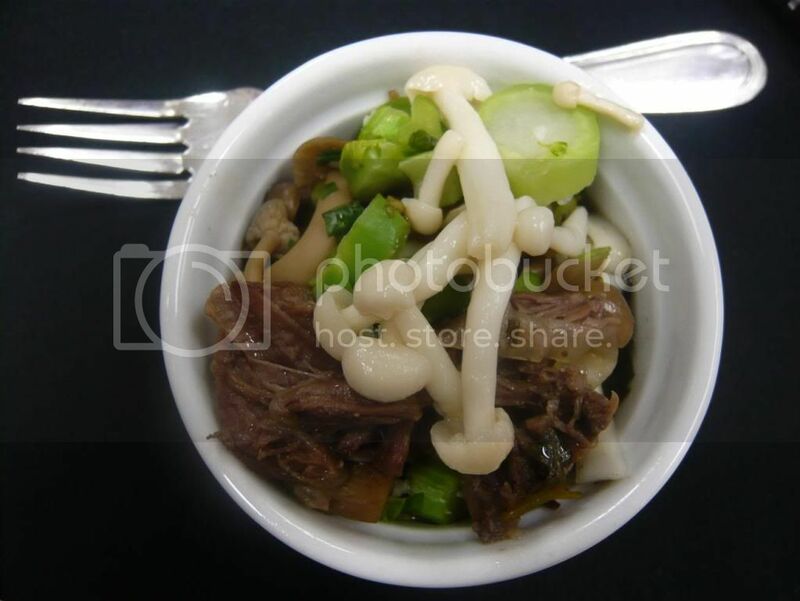 Just watching the chef season the beef and open up the claypot of the cooked beef was enough to get my appetite going. Here it is: Claypot-baked, slow-cooked beef with craked pepper, coriander, mushrooms. This was amazing! The beef was so tender, and the mushrooms were great. 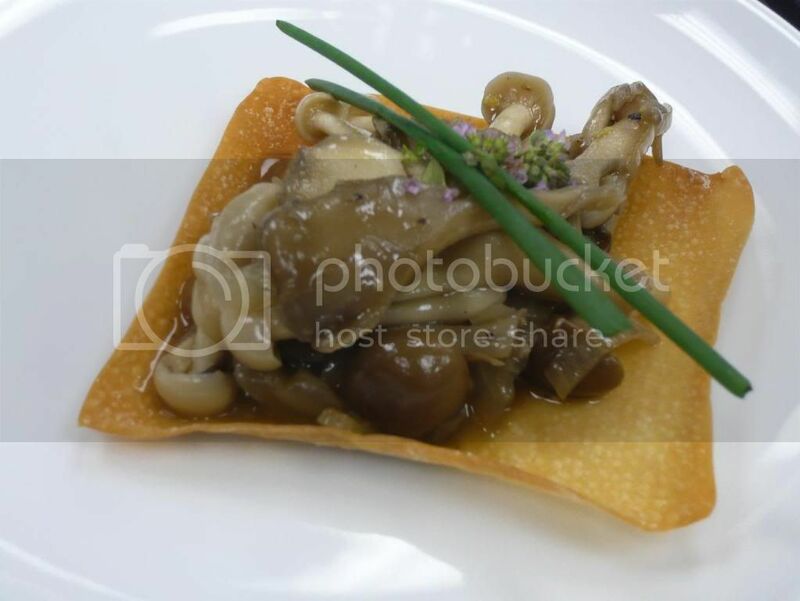 I just wish the dish was bigger :P The mushrooms are Hokto mushrooms grown in San Marcos, CA. The dish was paired with a 2004 Semler Cabernet Sauvignon, grown in the Malibu canyons. After licking our dish clean, we were ushered into the back room, the 'main stage' where tables are beautifully set. 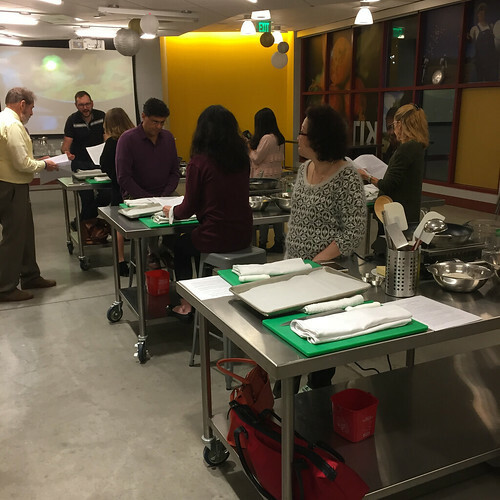 Because of the number of attendees, the class is not hands-on, but you can watch chef Kirschner prepare the dishes and take notes. Note the slanted mirror on top of the stove - so you can watch what's going on there too! 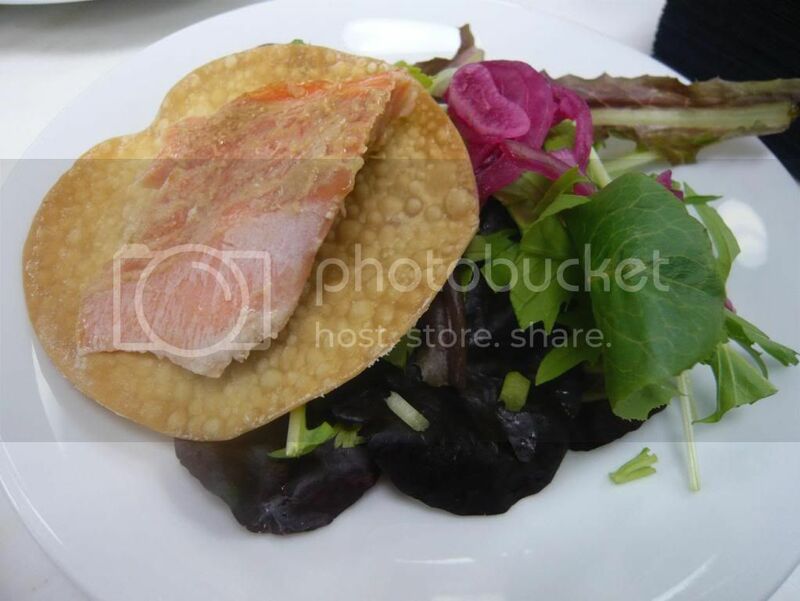 Chef Kirschner showed us how to prepare two dishes. 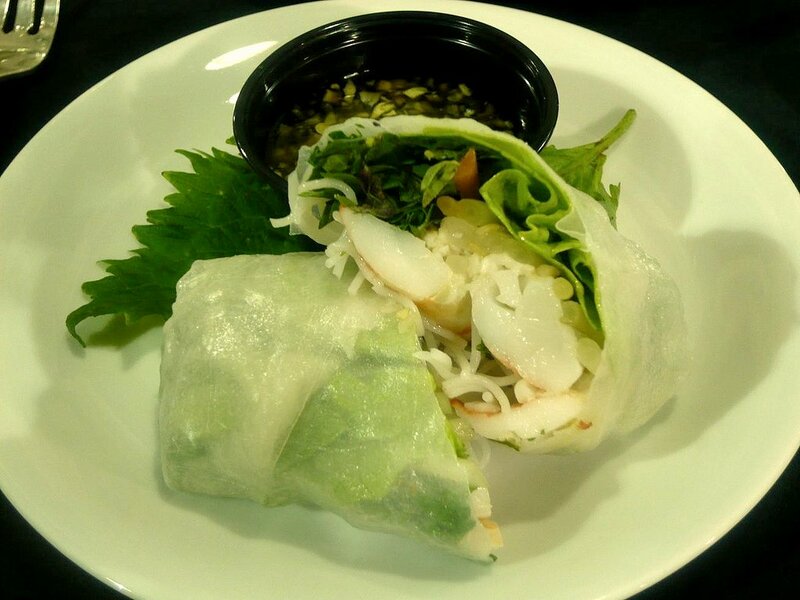 The first is a Shrimp Summer Roll with Chili Garlic Dipping Sauce. Paired with a Curran Gewurtztraminer from Santa Ynez Valley. 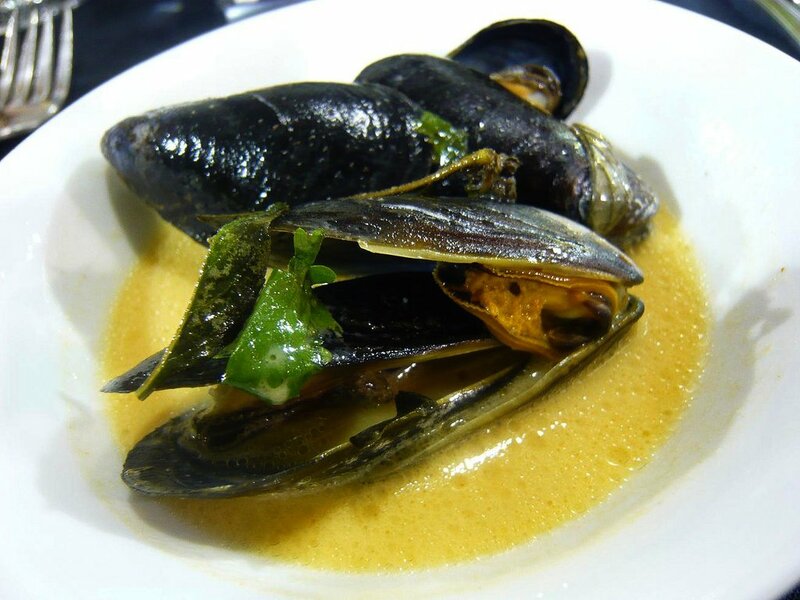 These mussels are certainly delicious and I can see why they are so popular at the restaurant. The curry broth is bold in flavor yet not too spicy. I'll definitely order this at Wilshire Restaurant. Here the dish was paired with a Sweeney Canyon Chardonnay. 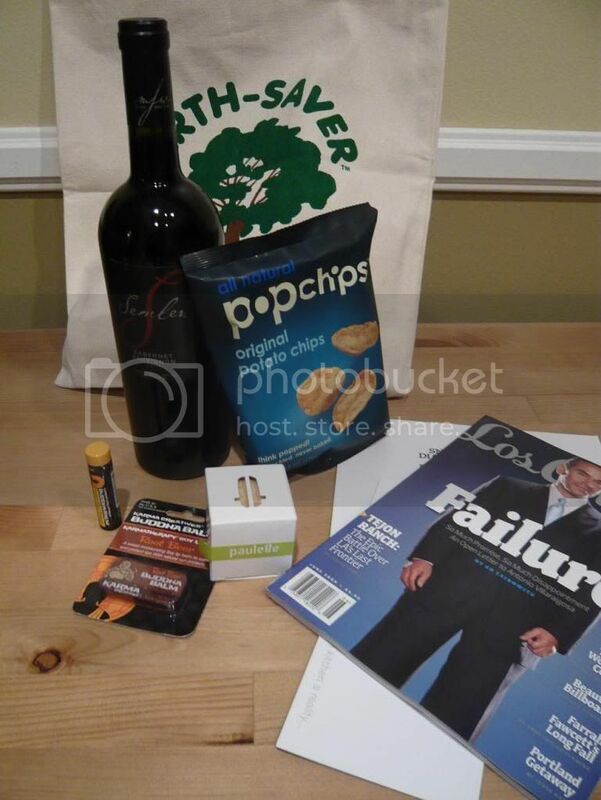 We all came home with a swag bag filled among others with a bottle of 2004 Semler Cabernet Sauvignon and the newest Los Angeles magazine. Read about the first class here. 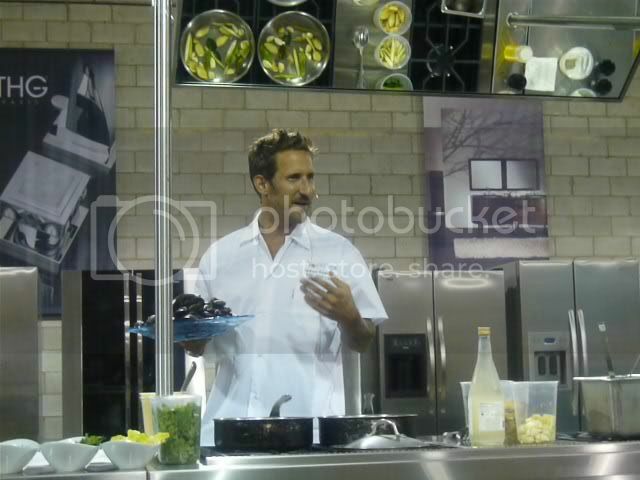 Los Angeles Magazine has partnered up with Snyder Diamond to host a series of cooking classes called Culinary College. 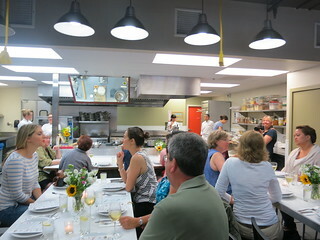 I was invited to attend their first class featuring Chef Patrick Healy from the Buffalo Club in Santa Monica. The event is held at the Snyder Diamond store in Santa Monica. The night starts off with a selection of wines from LearnAboutWine. Ian Blackburn was there pouring the wines himself. We started with a nice chilled 2008 Dashwood Sauvignon Blanc, Marlorough, New Zealand and a 2004 Semler Cabernet Sauvignon, Malibu Mountain Estate. The rest of the wine during the cocktail hour was paired with three hors d'oeuvres that Chef Bridget Bueche of Sub-Zero/Wolf was cooking in the showroom kitchen. Paired with a 2007 Mulderbosch Cabernet Sauvignon "Rose" Stellenbosch, South Africa. 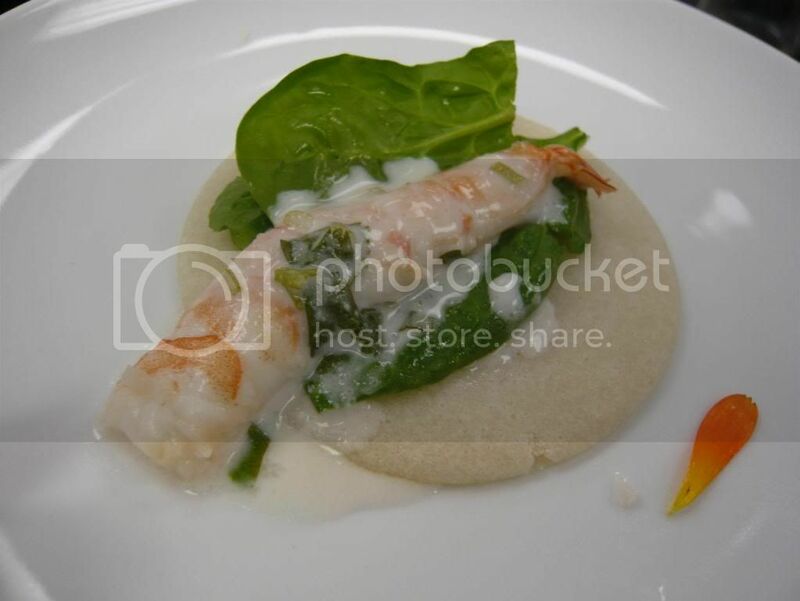 Shrimp paired with a 2007 Gerhard Riesling, Kabinett, Rheingau, Germany. The Riesling was very sweet, perfect for a dessert wine. I noted to myself to find a bottle of this since I love sweet, dessert wines. 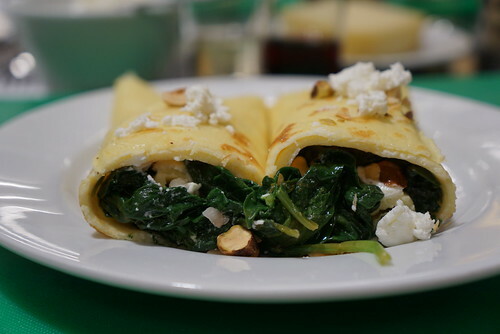 Paired with 2007 Domaine La Garrigue "Cuvee Romaine", Cotes du Rhone, France. The cooking class itself was set up in a back room at Snyder Diamond, where the tables for attendants have been beautifully set. 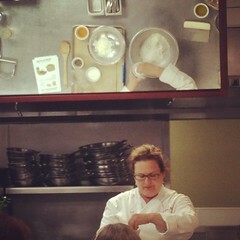 This isn't a hands-on class but the recipes are provided as you follow chef Healy cooking at the mock kitchen. 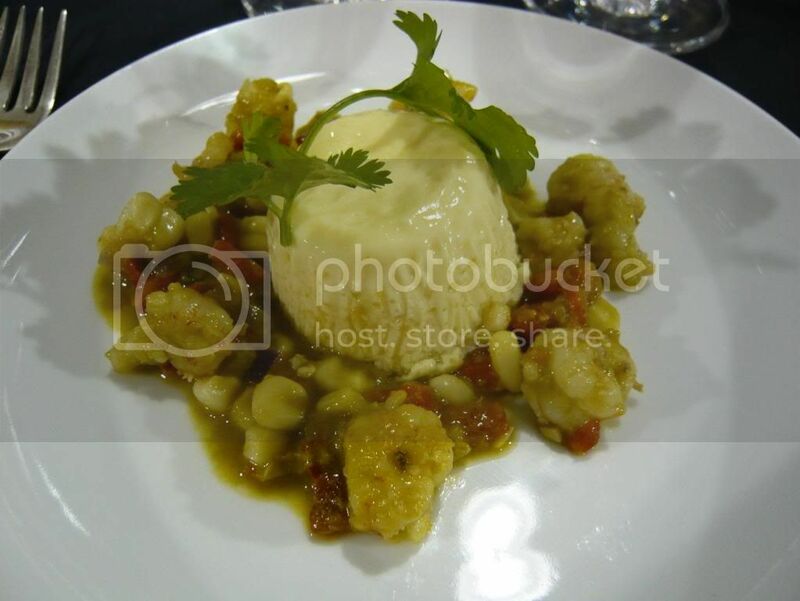 The first dish chef Healy made that night was this Summer Corn Pudding with Rock Shrimp Salsa w/ tomatillo sauce, paired with a 2006 Leasingham Dry Riesling "Magnus", Clare Valley. The corn pudding was dense and creamy, and it was great with the nicely spiced (but not spicy) rock shrimp in tomatillo sauce. I do love corn, so although I was late for my dinner, I waited to taste this dish and it was worth the wait. Vanilla pudding with caramel was coming up next, but I had to leave in order to make it to dinner. 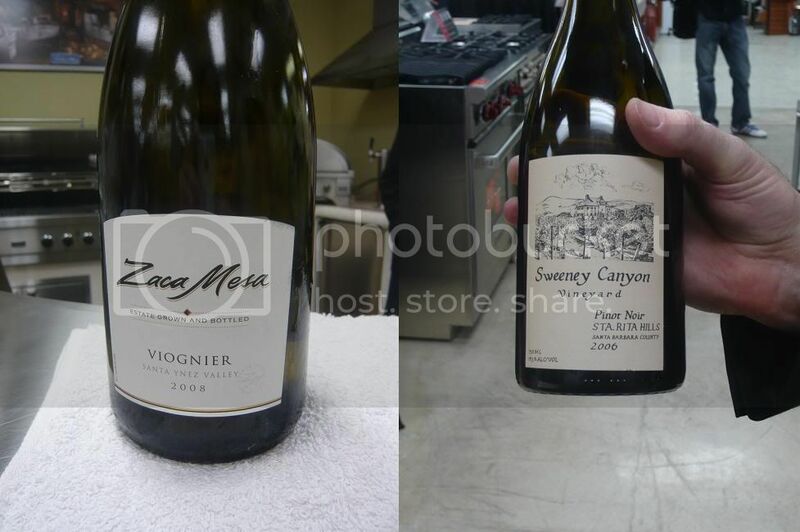 All attendants also received a nice swag bag containing 1 bottle of 2004 Semler Cabernet Sauvignon (wine in a goody bag! That's a first for me! ), Paulette macaroons (arguably one of the best in LA), the newest issue of the L.A. Mag, lip balms, etc. 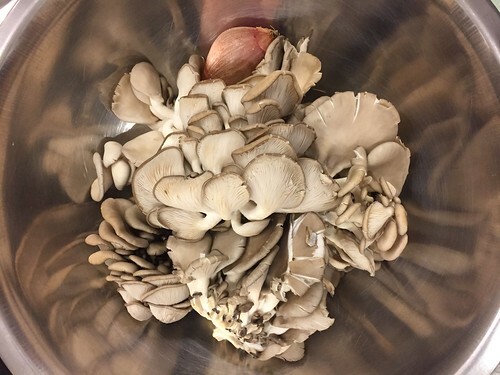 The Culinary College series will resume on July 15 featuring chef Andrew Kirschner of the Wilshire Restaurant, and on August 19th featuring chef Jason Travi from Fraiche and Riva. Each class costs $50 and if the first class is any indication, is well worth the education, food, wine, and swag. Please call Estrellita Dacanay at Los Angeles magazine 323-801-0034 to purchase.